Over the period of just over a month since my last report, a few changes have taken place with the gray foxes at the baylands. Since early December and on into January, the young foxes, the yearlings, have ignored the usual territorial boundaries as they are looking for their own territory and a mate. Foxes are coming and going through the area. They are for the most part solitary but they will pair up for a week, maybe two weeks and then move on. Along the creek, there are at least two and maybe four foxes both in the floodplain and along the creek down toward the slough. Last month there were none. The alpha female that I call Bold and who fought her “father” Squat for the natal den in fox hollow left the area for about six weeks. Before leaving, however, one morning I followed her, observing and taking notes as we went. She trotted on down into the hollow and bounded back into the brush, right where the den is located. Within a minute or so, coming up the road through the bare light of dawn trotted a fox hot on her trail, just sniffing everywhere she’d walked. His nosed swished from side to side. He followed her scent to where she had gone back into the brush a minute or so before. He bounded in after her and won her heart for about a week before he vanished. She didn’t seem to mind at all. She went off for about 6 weeks, found herself a male and this past week brought him back to the den area. She’s had three males over the past two months. 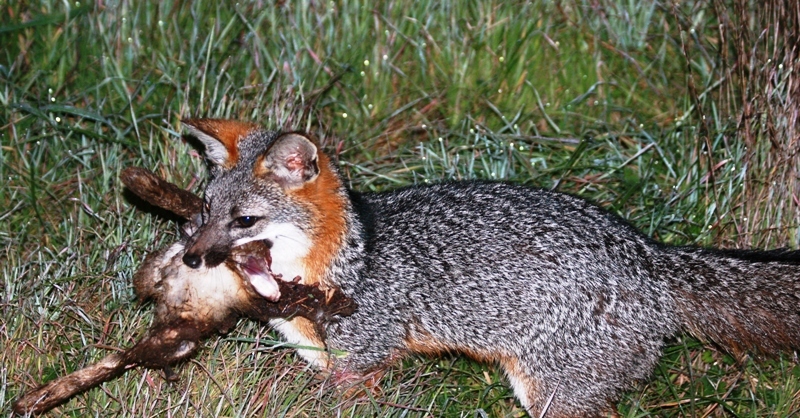 That’s typical gray fox behavior at this time of year. Coming up in February they will be settling down with their new mate and have their own litter near the end of March or the beginning of April. The two year olds and older gray foxes will be returning to their traditional den to have another litter. This is going to be interesting because with the female Bold seemingly in possession of her natal den, Squat might return to reclaim it and if so then what might happen down in fox hollow is anyone’s guess. In my last Fox Report, I mentioned that I would be doing some public presentations – a PowerPoint show with video of the pups taken by my trail cameras – in the coming months. I am scheduled to present one on March 4th at the Redwood City Library for the local Sierra Club. I will send out more detailed information on it soon.